MANILA, PHILIPPINES (8 January 2018) — The Asian Development Bank (ADB) today launched a photo contest on Instagram to showcase the development progress in the Greater Mekong Subregion (GMS) and demonstrate how a focus on increased regional cooperation and integration can improve people’s lives. The online photo contest, which will be held using the hashtag #GMS25, is part of the 25th anniversary celebrations of the establishment of the GMS Program. GMS countries are Cambodia, the People’s Republic of China (specifically Yunnan Province and Guangxi Zhuang Autonomous Region), Lao People’s Democratic Republic, Myanmar, Thailand, and Viet Nam. The contest is open to nonprofessional photographers, of any age from ADB’s member countries. Images must be original and taken personally by the photographer, not previously published, and showcase daily life in the Mekong subregion and how lives have changed in the last 25 years. Contestants can submit as many photos as they like. 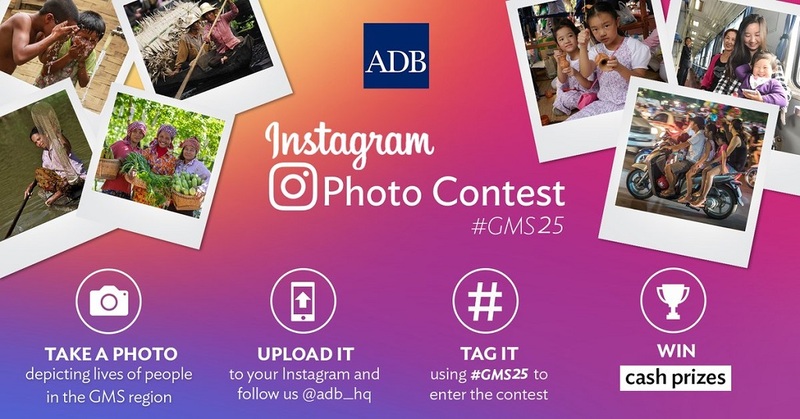 To enter the contest, post the photograph on your Instagram account using the hashtag #GMS25 and tag @ADB_HQ. Photos can be posted between 8 January 2018 and 9 February 2018. Winners will be announced on 20 February 2018. First prize winner will receive $500, second prize winner will get $200, and third prize winner will take home $100. Winners will be judged on the merit of their content or on the number of Instagram likes. To see full rules, prizes, and to get information on the contest, go to this link. Established in 1992 with support from ADB, the GMS Program helps the implementation of high priority subregional projects in transport, energy, telecommunications, environment, human resource development, tourism, trade, private sector investment, and agriculture. As of 2016, ADB has approved $7.3 billion in loans for 84 GMS investment projects, with GMS member countries and development partners providing $4.9 billion and $6.9 billion, respectively. The Sixth GMS Summit of Leaders, with the theme, Leveraging on 25 Years of Cooperation, and Building a Sustainable, Integrated, and Prosperous GMS, will be held on 29-31 March 2018 in Viet Nam. The summit will be attended by GMS leaders—who are expected to endorse the Ha Noi Action Plan 2018-2022—as well as other senior public officials, private sector representatives, development partners including ADB, and members of the media.